"Palestinian Theologian" Trashes "Palestinian Theology"
This article was originally published by the Gatestone Institute. For over two decades, parts of the Christian world have been bemused by the writings of self-styled "Palestinian Christian theologians." Since their brightest lights are Protestant pastors, they are minor figures among the overwhelmingly Orthodox and Catholic faithful of the Holy Land. But they are strangely popular in Liberal Protestant circles abroad and especially beloved of church bureaucrats. Now one of them, Lutheran Pastor Mitri Raheb of Bethlehem, has trashed all the efforts of "Palestinian theology" to date as an irrelevant rehash of nineteenth century European theology. And what is his new starting point? Basically, nineteenth century race theory. For decades, Raheb and his Anglican counterpart Naim Ateek have been touring Protestant churches in Europe and North America and conducting seminars in "Palestinian theology." That is: purported theological underpinning for Palestinian political aims. Students in Protestant universities have been obliged to swallow down their books and regurgitate them in examinations. Those who questioned this new orthodoxy might face serious obstacles to their academic future. Ateek in Jerusalem and Raheb in Bethlehem opened educational institutions to which theology students were sent from abroad. Recently, Raheb received authorization from the Palestinian Authority to grant BA and MA degrees. So for Raheb to denounce all that purported theologizing was to drop a big bomb. 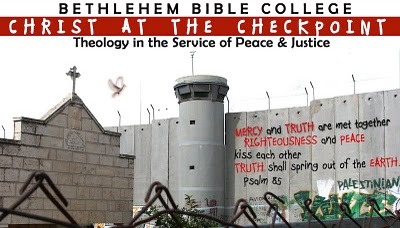 Raheb was talking on "Contextual Palestinian Theology as It Deals with Realities on the Ground" at the March 2010 "Christ at the Checkpoint" conference in Bethlehem. He began by promising a "new way of thinking" because "we all, even as Palestinians theologians, we were dancing on the rhythm of European theology of the 19th Century, trying to react here, to react there, to change here and there, but the assumptions, the systems of thinking, was [sic] still 19th Century Europe." Thus far, in trashing all the previous work of himself and Ateek, together with the lesser luminaries of this genre, Raheb was correct. Both Raheb and Ateek hold doctorates from foreign universities, written under that kind of old-time European influence. But the continuation of Raheb's talk is so academically frivolous that one wonders how he received a doctorate in the first place. The "first assumption" of his new way of thinking, he announced, is that "the Bible could not have been written anywhere else but in Palestine." Now, such books as Esther and Revelation explicitly state that they were composed outside the Land of Israel (in Persia and on a Greek island respectively). Is Raheb so ignorant of his Bible? His second assumption is outrageous, echoing nineteenth century attempts to obscure the Jewish origins of Jesus, which peaked in the "Aryan Christianity" of Nazi Germany. It is that "the Palestinian people and part of the Jewish people are the continuation of the peoples of the land" whereas "Israel represents Rome of the Bible, not the people of the land." Why? Because "I'm sure if we were to do a DNA test between David, who was a Bethlehemite, and Jesus, born in Bethlehem, and Mitri, born just across the street from where Jesus was born, I'm sure the DNA will show that there is a trace. While, if you put King David, Jesus and Netanyahu, you will get nothing, because Netanyahu comes from an East European tribe who converted to Judaism in the Middle Ages." Even if Raheb's claims about the ancestry of himself and Binyamin Netanyahu were true, he would be putting them at the service of a shameless racism. But, of course, he also has not the slightest evidence to support those claims. He knows nothing of Netanyahu's ancestry. And he himself, for all he knows, may be descended from Greek pilgrims or from Europeans who arrived with the Crusaders, as I have pointed out elsewhere. As for DNA, had he taken the trouble, Raheb could have found that genetic studies on Jews have shown that European Jews are genetically much more closely related to Jews in the Middle East, and even to some non-Jews there, than to non-Jewish Europeans. Recall that the leitmotif of "Christ at the Checkpoint" was the claim that today Israeli checkpoints would prevent Joseph, Mary and Jesus from ever getting to Bethlehem. In fact, of course, if today a Jewish couple expecting their first child tried to set up house in Bethlehem, they would be denounced by the UN, the US State Department and all the world's foreign ministries as illegal settlers. And Mary would be lucky to live long enough to give birth. So here comes Raheb to the rescue. As Yasser Arafat liked to say, Jesus and Mary were not Jews but Palestinians; so no problem. "And being born just across the street from where Jesus was born," adds Raheb, "I always loved to say that most probably one of my grand, grand, grand, grandmas used to babysit for Jesus." Once again, Raheb displays ignorance of or contempt for his Bible. According to Matthew's Gospel, the Holy Family fled Bethlehem for Egypt shortly after the birth of Jesus. If anyone babysat for Jesus, it was either Alexandrian Jews or Copts. We need not pursue further Raheb's "new thinking" except to note its fundamental aim: to show that wherever the Bible talks about a Chosen People, it means today's Palestinians and specifically the Palestinian Arab Christians. Yes, he really means to make that preposterous claim. Consider a few quotations, and note that his initial inclusion of "part of the Jewish people" has vanished: now it is just Palestinians. "Actually, the Palestinian Christians are the only ones in the world that, when they speak about their forefathers, they mean their actual forefathers, and also the forefathers in the faith." "So, that is the reality of the peoples of the land. Again, they aren't Israel. This experience I'm talking about, it's only the Palestinians who understand this, because Israel represents Rome." "It was our forefathers to whom the revelation was given..."
If one reads attentively all the "Palestinian theology" produced by Raheb and Ateek and their like, one finds that this claim about Palestinian chosenness, with the concomitant disqualification of Israel, is the whole point of the exercise. All the rest is baseless rigmarole, churned out in the attempt to get to that conclusion. The significance of Raheb's speech is his acknowledgement that all their previous rigmarole cannot survive serious examination. His puerile attempt to start a new rigmarole merely confirms this. Not that this will diminish the adulation of Raheb and Ateek among their admirers. For they are admired not for their intellectual integrity, but for their services in the delegitimization of contemporary Israel and of the contemporary Jewish people. Despite his averred repudiation of nineteenth century theology, Raheb is repackaging the claim of old-time theologians that the Church is the "New Israel" that has replaced the Jewish people, that the Bible now belongs to Christians alone. In Raheb's view – it belongs just to Palestinian Christians. Thus Raheb habitually receives rapt attention in Germany. He was awarded the "International Aachen Peace Prize" in 2008. Frequently, he has been fêted at Kirchentage, the mass jamborees of German Christians. He was most recently featured at the joint Protestant-Catholic Kirchentag hosted by the Lutheran Church of Bavaria in May 2010, two months after his Bethlehem speech. No matter what he said. Raheb was also the star witness at the session of the 2004 General Assembly at which the Presbyterian Church of the USA voted to divest from various firms that do business with Israel. Two years later, after much controversy, the next General Assembly of the PCUSA voted to replace that resolution and apologize for allowing itself to be misled in 2004. Still, we have to be grateful for the spectacle of Raheb's performance in Bethlehem. On the one hand, he threw all previous "Palestinian theology" into the rubbish bin. On the other, any decent university would grade his "new thinking" with a fail, if submitted by a non-Palestinian student. "Palestinian theology" may still have its admirers, but they are staring at a naked mini-monarch.